Have you tried the new email your transport feature? It’s Happy National Mutt Day! 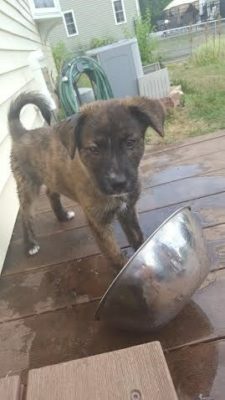 On July 10th I prepared myself for my first animal transport as a Doobert.com volunteer. 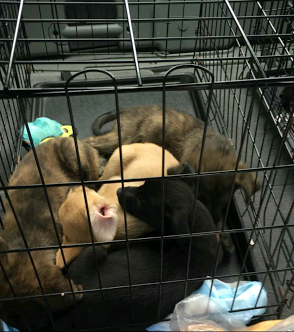 I was to be driving a litter of seven shepherd puppies through the last leg of their journey from Binghamton, NY to Utica, NY. I was, of course, so excited to see the adorable puppies and finally get them to their new home. However, to my surprise, I was a bit nervous too! It hit me that morning that I would be responsible for these seven energetic pups and I wanted everything to go as smoothly as possible. I spent the morning of the transport preparing everything for the trip and assuring that the puppies would have a comfortable ride. So, I put together some tips for other new volunteers to read through before their first transport. Get supplies together early so you have everything ready to go before you head out. The animals will most likely be traveling with everything they need, but it never hurts to have extras! Read through “How to be a Doobert transporter” on the Doobert website. Here you will learn what you will need to be a great transporter. Get to the pickup meeting point a bit early. Make sure you know where you’ll be meeting the other volunteers so things don’t run behind. Keep in contact with the other volunteers, especially the Transport Coordinator. It’s important that others know updates on the trip and how the animals are behaving. The trip with the puppies went extremely well. I met another volunteer, Dawn, outside a Cracker Barrel restaurant and we put the pups in their pen to take a quick rest before bringing them to their final stop. They were sweet, energetic, and very well-behaved. After placing their crates in my car and packing up their supplies, the pups promptly fell asleep cuddling. They had a silent rest of the trip and we arrived safely at the last meeting stop. Brenda of Whispering Pines Animal Rescue was there to pick up the puppies and take them to their final rescue. 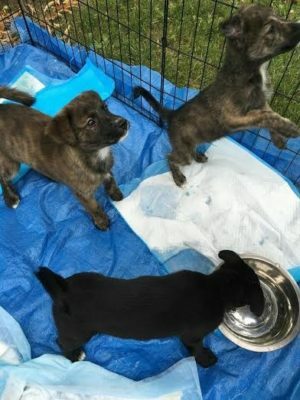 She informed me as we transferred everything into her car that these sweet, beautiful puppies were going to be euthanized at their former shelter in Georgia. Because of us volunteers, they would be able to live out the rest of their lives with loving families which gave me such a gratifying and happy feeling. The next morning, my family and I returned to Whispering Pines Animal Rescue to see about adopting one of the female pups from the litter. That day, we went home with a new addition to our family: Kora! Now, I’ll always have her to remind me of the first animal transport I ever did for Doobert.com. Thank you for writing this. Writing doesn’t always come easily to me, so I appreciate the effort. I just started with Doobert and I have my first trip today (10/20/17)! Thank you Kristen for sharing. I am very glad to know that this was helpful and hopefully inspiring to you. YOU are inspiring to ME! Everything I do on Doobert is all about supporting the awesome people like you to get involved and help save more animals. I welcome the feedback, ideas, suggestions and yes even complaints so that I can keep making Doobert better, more efficient and even more powerful. It’s all about the animals and I appreciate you taking the time to share! I would like to know more about the dogs being transported and their story , however, I can’t seem to find much. I enjoyed my first transport and I just volunteered for my second and its going to be the same dog!